Do you take the electricity in your home for granted? Don’t be ashamed; most of us do. We flip on the switch expecting the lights to come on. We expect the thermostat to kick the A/C on and off to keep our homes at the optimal temperature. It all seems so natural, having a steady flow of electricity into our homes. That is until the power goes out! Suddenly our perfect little lives are thrown into disarray. The robotic vacuum zooms around the house looking for its charger, only it can’t find it because there is no power. You wake up in a panic because you hear something banging into walls. Alarmed it could be an intruder, you turn on the light switch to asses the situation only to find that the lights don’t come on. You walk out into the hallway to discover it’s only the vacuum. You turn it off and set it back on the charger. You start to think about the food in the refrigerator and whether or not your wife is going to be able to use the hair straightener. Now your power outage experience may be a little different from mine, but the fact remains that our lives rely on electricity. When the power goes out it is hard to function in the ways we have become accustomed to. Thankfully, however, Dixie Power has a 99.9% reliability score as well as several backup feeds to make sure they can provide constant power to their members. This means we as members of Dixie Power almost never have to deal with power outages. This is made possible by Dixie Power’s planning and by the lineman’s excellent implementation. 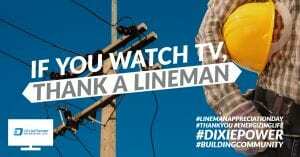 In honor of lineman appreciation day, I would like to submit 3 reasons why you should thank a lineman. 1. They are the only reason you have electricity. Have you ever taken the time to think about where electricity comes from, and how it even gets to your house? The electricity that charges your phone and turns on your lights is generated several hundred miles away. It is because of the work of linemen who have strung hundreds of miles of high voltage line from the power generation plant to the subdivision where you live. As the power comes into the city it is routed through substations that transform the electricity to a lower voltage. The linemen run lines from these substations to the very street that you live on. When the electricity gets to your street the linemen once again lower the voltage by sending it through a little green box called a transformer. This allows for the electricity entering your home to be the typical 120-volt standardized power we have all come to love. All of these transmission lines, substations and transformers are constructed or installed by linemen. What causes the power to go out? Typically storms, high winds, snow, and rain. When we are bundled up in our homes safe from the elements, it is linemen who brave the storm to restore power. It doesn’t matter if it is 3 p.m. or 3 a.m. Our linemen truly are soldiers in the storm working to keep us safe, happy and comfortable on the homefront. When you look at the typical outlet in your house, I think we all have a little trepidation about the dangers involved with electricity. We make sure our kids aren’t sticking foreign objects into the outlets and for a good reason. There is a real risk involved in dealing with electricity. Now inside our homes, we are typically talking only 120-volts to 240-volts maximum. Linemen are dealing with voltages from 13,800 volts all the way up to 765,000 volts. I think we can all agree that we want to leave this work to the professionals. Linemen go through extensive training to prepare themselves for dealing with risks associated with their job. Linemen are part of a brotherhood because of the dangers of their job. They are constantly looking out for one another and making sure each has the other’s back. If you have the chance, thank a lineman for risking their lives every time they go out on a call. Also, thank the families who spend the time worrying about their safety. This is the story of Jeremy White, a lineman who tragically lost his life to the trade he loved. I share this only because it gives you some insight into the dangers that linemen are up against every day. I hope this post has been able to give you a glimpse into the life of a lineman. We should not take for granted the comfort we are able to enjoy from the many men and women who work hard to provide us with reliable electric service. 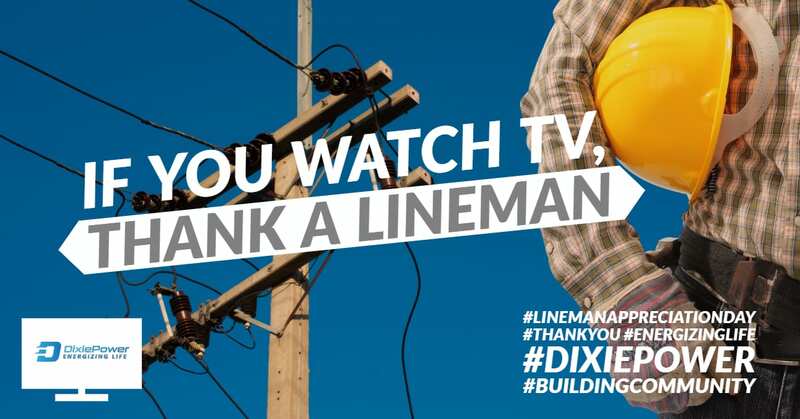 Take the time to reach out and thank the linemen in your community. A little bit of appreciation can make a world of difference to these unsung heroes and help them to continue doing what they love. Head on over to www.dixiepower.com to show your appreciation today.